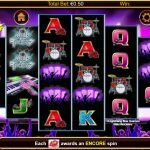 If you want to be the star of the show now you have a chance with Mild Rockers, a video slot game from Lightning Box. 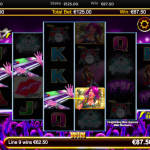 This is a fast paced game that brings rock ‘n’ roll to online gambling. The band is here to help you if you get a stage fright with all those cheering fans. Maybe the best part of the game is the sound effect that complements Mild Rockers in the right way and brings the game to life. The wild is the purple haired woman and its function is to stand in for every other symbol to complete a winning line. The only symbol it cannot substitute is the scatter. The lip symbol is the scatter and if you land at least 3 you will initially receive 8 free spins. During the feature for every lip symbol you land you will receive one Encore Spin. These Encore Spins are collected and they will start when the feature is over. There is one extra symbol the Wild Rockers which acts as an extra wild. So there are 2 wilds during the feature which can mean only one thing, big wins are on their way. 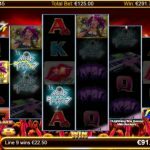 Mild Rockers is a unique video slot game and we have to say kudos to Lightning Box for doing such an amazing job. The game has everything we are looking for in an online slot. We love what they did with the design and how they crafted the symbols by paying attention to every detail possible. There are a couple of symbols and features that will make the game lay more interesting and profitable for you. The betting options are wide so every kind of a player can find the right bet size that can suit their bankroll. For another great engaging slot you should consider playing Five Pirates a 5 reel slot by Lightning Box.